This project aims to uncover the lost post-apocalyptic landscapes of Canterbury through the narratives of Russell Hoban’s Riddley Walker, set in a futuristic East Kent following nuclear devastation, and the Anglo-Saxon Andreas, set in the ruins of a Roman city peopled by devil-worshipping cannibals. Both texts are concerned with rediscovering lost truth in ruinous urban landscapes, and with the process of finding and constructing meaning in the world around us. Over a thousand years separate the writing of these works of literature, but together they have much to tell us about the enduring power of these landscapes on the popular imagination. ‘O what we ben!’ offers a walking trail through the city of Canterbury guided by the narratives of Riddley Walker and Andreas, punctuated by places in the cityscape that connect with both works. This is the first time that a city walk has brought together early medieval and modern texts to demonstrate their connection to the surviving fabric of an ancient city, in the case of Andreas, and one that has yet to be reduced to rubble, in the case of Riddley Walker. By walking this way, or making a virtual visit, you can encounter the texts through elements of the city’s landscape from prehistory to the present day. By clicking on the following dates you can book to join us on a tour on Friday 17th November (preceded by talks that will be posted here at a later date), Friday 24th November, or Saturday 25th November. ‘O what we ben!’ is funded by Being Human Festival of the Arts and Humanities 2017, and the Faculty of Arts and Humanities at Canterbury Christ Church University. The project is led by Mike Bintley and Sonia Overall. 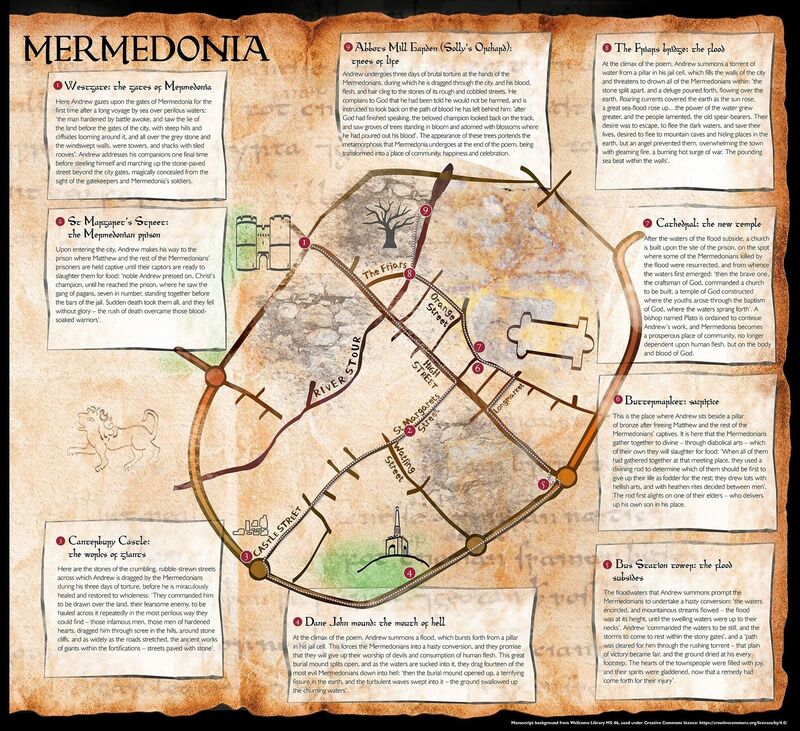 The Andreas and Riddley Walker maps were designed by Celia Rumley at Amber Designs, and sound was recorded by Ben Horner at Canterbury Christ Church University. The funding bid was kindly supported by our partners Folkestone Book Festival and Canterbury Archaeological Trust. 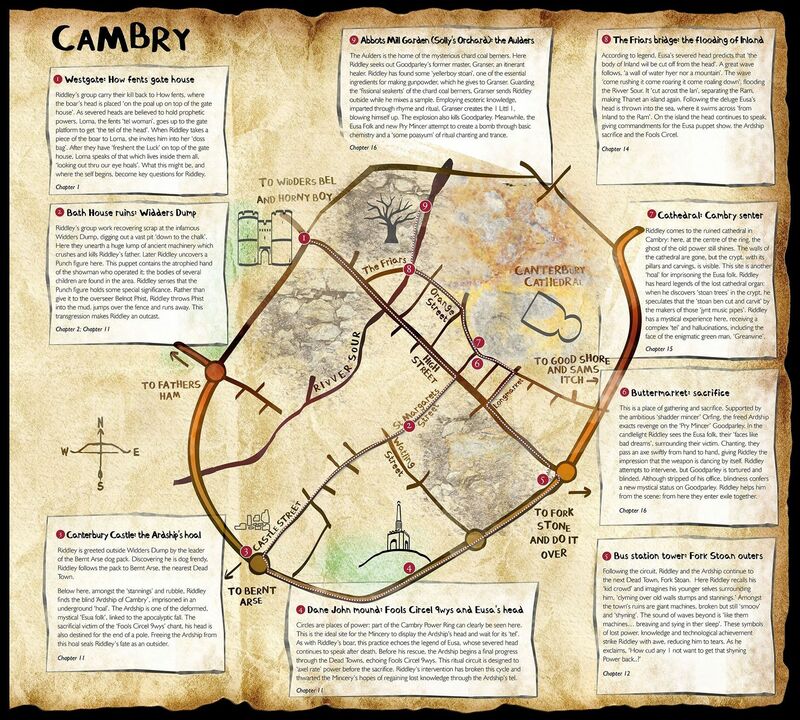 The maps below trace a walking route through modern Canterbury that follows the path of Andrew through the Anglo-Saxon poem Andreas, and Riddley’s route as he makes his way through Russell Hoban’s Riddley Walker, stopping at nine locations within the city walls.